The hotel is rightly proud of its heritage and age – first opening its doors in 1490 as the Thaltor-Herberge, they are quick to point out that the place was welcoming guests even before Christopher Columbus discovered the new world. Its ancient history, though, is arguably eclipsed by the more recent. Indeed, the rise of Munich’s cultural scene in the mid to late 19th century meant that the hotel received iconic guests whose works are still performed and revered to this day: Franz Liszt, Felix Mendelssohn-Bartholdy, and, it is thought, Hans Christian Andersen. 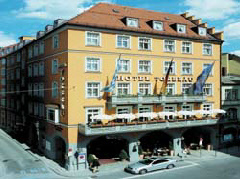 Four star rated, the Hotel Torbrau offers over 90 guest rooms in total, some of which feature four poster beds. Dining options within the hotel are available at the restaurant Schapeau, while much of what the heritage-rich city of Munich has to offer the visitor is but a short walk away.